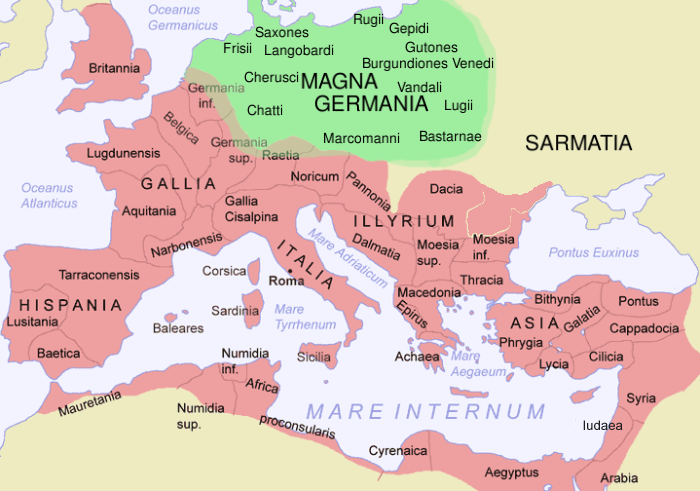 The tribes roaming in Germania were described by the Latin-speaking Romans as barbarian Germanii. They are not easily distinguishable from neither the Celts, (i.e. Gauls), nor Scythians, like the Gepids. Veneti, an alternative appelation for early Slavs, (Sclaveni), also called Antes (people), an appelation used by Jordanes in his Getica concering the history and geography of the Goths, seems to be more strongly identified by Jordanes with the geographical Germania Magna, than the Goths. The population mix changed over time by assimilation, and especially by migration. The various peoples north of the Alps, Magna Germania, were rather nomadic (Scythian) and semi-settled. The Germanii, were thus a rather generic term for the Romans, signifying whoever roamed these territories, as were the Scythians, meaning nomads, and the Antes, meaning who came from before.